Nevada County, with gold country foothills and Sierra Nevada mountains, has almost 100,000 residents and many visitors. 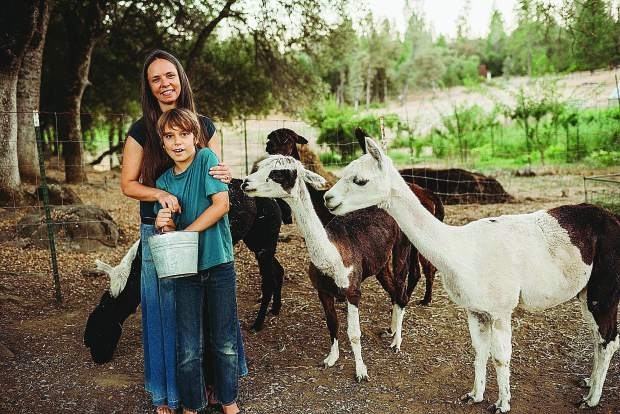 Nevada County Grown, dedicated to promoting, empowering and connecting local farmers, ranchers and food makers, is twelve years old and ready for new adventures. 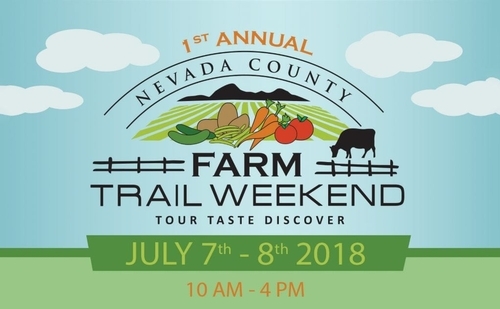 On Saturday and Sunday, July 7- 8, 2018, twelve local farms and ranches will host the public for tours, tastes, demonstrations, workshops and music at the first annual Nevada County Farm Trail Weekend. Nevada County Grown board member Sammie Bass is coordinating the event. Today, a few days before the big weekend, she shared a little bit about the process and challenges of organizing something never done before in Nevada County. 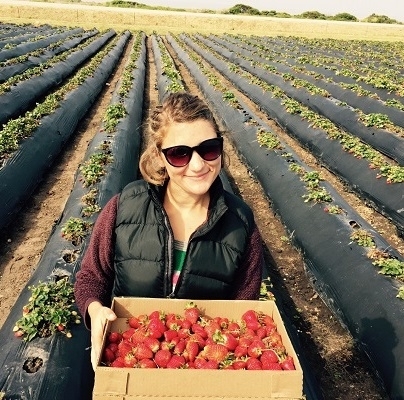 Organizing participating farms and ranches: Sammie started planning the July event in April and May, so, understandably, communication with potential participating farmers was a major challenge. It was difficult to get clear answers from farmers about what tours, product sales and activities each would be offering to visitors, and to make sure that each participating farm was appropriately safe and prepared. Sammie visited each of the farms and worked with the owners to plan parking and safe access. Would room for ten cars be enough? Is the turn into the driveway from a busy road safe enough? She had no way to know. Permits needed? 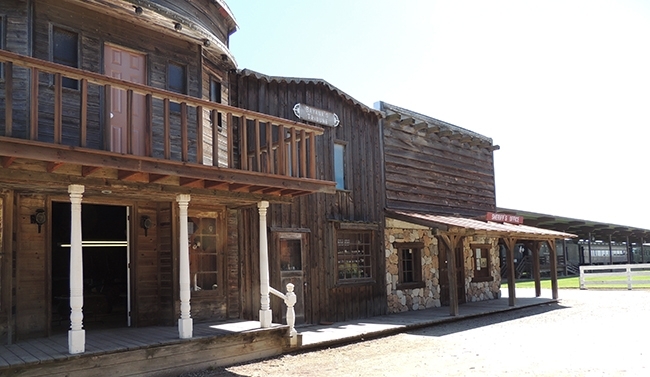 Nevada County recently adopted new zoning ordinances that clarified that agritourism activities including tours, farm dinners and U-Pick are allowed by right on agricultural zoned lots over five acres. 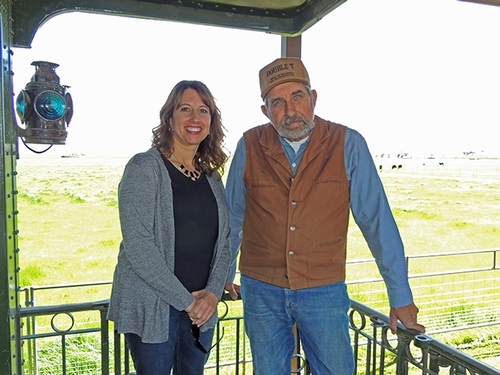 To make sure that all interested farms and ranches qualified under this zoning, Sammie shared her list of fifteen potential participants with the county agricultural commissioner. The Commissioner rejected several on the list as being less than five acres or zoned rural residential rather than agricultural, so not eligible to host visitors on their land without an expensive conditional use permit. 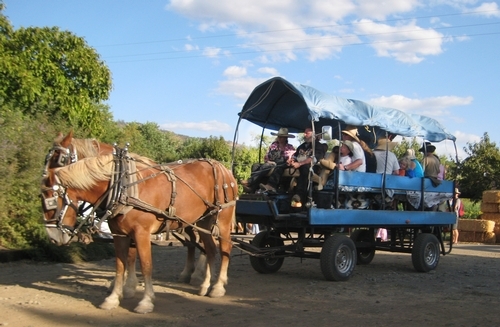 However, as a work-around, these few farms are allowed to have farm stands and to sell their products during the event, but not host tours or other activities. Insurance? Nevada County Grown required that all participating farms and ranches have liability insurance coverage of at least a million dollars, and that each list Nevada County Grown as an additional insured on their policies. In addition, Nevada County Grown has insurance coverage for events that they organize. Day-of ticket sales? The Passport Weekend ticket (actually a wristband) is priced at $20 for advance sales and $25 on the day of the event. It was tough to organize enough volunteers to staff check-in and ticket sales tables at each of the twelve participating venues. Therefore, four visitor check-in hubs will be set up at four of the venues. 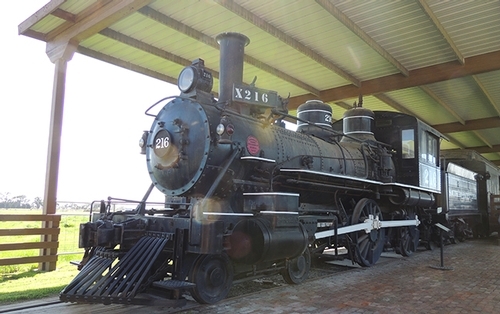 If visitors show up at the other locations without wristbands, the participating farmers and ranchers will include them in tours and activities and instruct them to check in and pay at one of the four check-in hubs for their next stop. Food? Lunch stop? Since this is the first-ever Nevada County Farm Trail Weekend, and since most of the farms and ranches are not set up to cater food for guests, Sammie investigated inviting a food truck to feed the guests. However, she could not promise more than 150 - 200 visitors total, which is not enough to pay for a food truck's time, labor and travel costs. 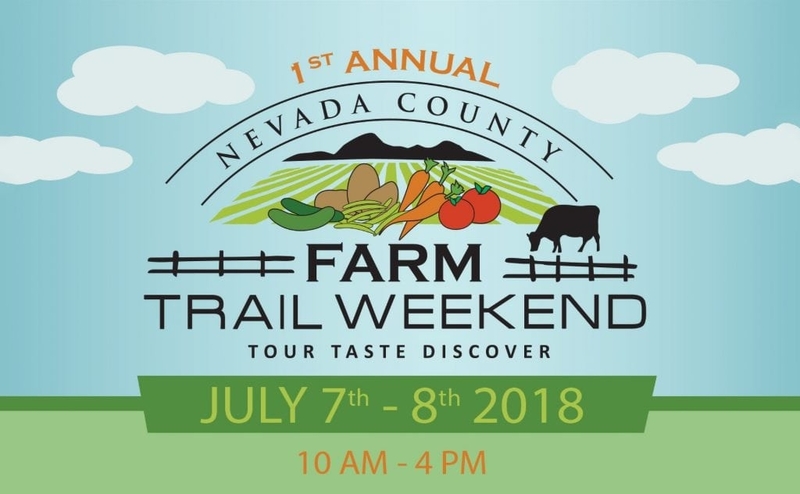 Instead, the Nevada county Food Bank, one of the stops on the trail, will put on a barbecue, offering lunch for a donation (on Saturday at least) and giving tours of the Food Bank Garden. Farm Trail visitors may want to bring along a picnic this time. Promotion: Good Day Sacramento came out and took videos, as did CBS13, helping to promote the event. In addition, local newspaper, The Union, interviewed organizers and wrote an article showcasing participating farms and ranches to local readers. About thirty years ago, young organic farmers Dru Rivers of Full Belly Farm and Annie Main of Good Humus Produce were having trouble selling their dried-flower wreaths at small shops and art shows around Davis, so they had a little brain-wave. They decided to bring people out to the farm to see where the flowers were grown. 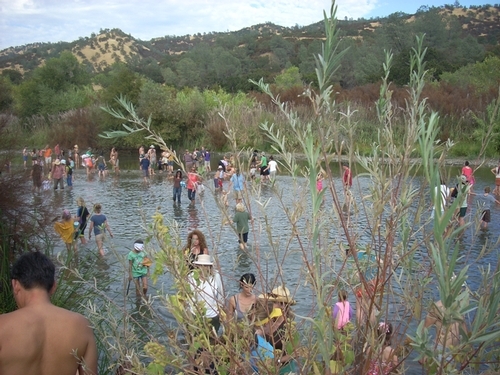 To their surprise, two or three hundred people showed up for an afternoon at Full Belly Farm in the Capay Valley, a couple of hours northeast of the San Francisco Bay Area. Dru gave a spinning demonstration and introduced the visitors to a few sheep. Annie, Dru and two other women in the wreath-making group gave a wreath-making demo and led a tour of the farm. Dru remembers, “ It might have been a potluck; we didn't sell any food. There was some sort of music, probably bluegrass. People walked down to the creek. The trail was all overgrown then; there wasn't a path. It was a miracle that people came, even some people we didn't know! We probably sold about five wreaths that day.” That was the first Hoes Down Harvest Festival and the start of a tradition enjoyed by thousands of Northern Californians. A few months later, at the annual EcoFarm Conference of California organic farmers, an announcement on the bulletin board invited everyone to the second annual Hoes Down Harvest Festival, a fundraiser for the EcoFarm Conference, tickets $5 a person. There was no going back. The annual festival grew by a hundred or more people every year. Dru Rivers was the primary Hoes Down coordinator for many years. Full Belly Farm partner Judith Redmond coordinated the volunteers. Annie Main was the brains behind the children's area full of farm crafts, ice-cream making, a huge hay fort, story telling and games. Other Capay Valley farmers and community members joined in the effort every year as organizing volunteers. Hundreds, and then thousands, of San Francisco Bay Area and Sacramento farmers' market shoppers and Capay Valley farms' CSA members made the annual drive to enjoy the festival and visit the source of their vegetables. In the early years, creativity thrived on a shoestring budget. Dru recalls, “for three or four years we used to to put up long irrigation pipes and string a huge nylon tarp that had come from Christo's ‘Running Fence' project to make a big tent.” These days, a crew sets up large festival tents and awnings for the event. After running entirely on volunteer energy for more than fifteen years, the organizers hired a former Full Belly Farm intern, Gwenael Engelskirchen, as part-time Hoes Down coordinator in 2002. Gwenael, who now works with the UC Sustainable Agriculture Research and Education Program, says she started in late spring. The monthly organizing meetings at Full Belly Farm usually were ten or twenty people – each taking responsibility for an area; music, crafts vendors, kids area, food, even a committee on how to make the festival environmentally friendly. For many years, before biodegradable plates and utensils, Hoes Down organizers borrowed hundreds of dishes from Davis's Whole Earth Festival, which were washed by several shifts of volunteers all day and into the night. The Hoes Down Harvest Festival has always been a community effort, drawing on the volunteer energy of Capay Valley farmers and community members for months of planning and on donations from food to equipment to art and wine for the silent auction. Gwenael remembers a big roll of poster paper taped to the wall of the barn about ten days before the festival, listing all the donations from farms, businesses and vendors, and the names of who would drive where to pick up what in time for the festival. Dru Rivers and Annie Main have passed leadership of organizing the Hoes Down Harvest Festival to the next generation. Dru's daughter, Hallie Muller Ochoa, took over as Festival Coordinator six or seven years ago, and has now handed the job over to Claire Main, Annie Main's daughter. A young neighbor farmer, Annie Hehner, is now in charge of the popular children's area. All of the proceeds from the Hoes Down Harvest Festival go to non-profit organizations that support sustainable agriculture and rural living. Over its thirty year history, the festival has raised about a million dollars. The 2016 Hoes Down Festival raised about $90,000. None of the money raised has gone to Full Belly Farm; it has all been donated to organic farming and local agricultural organizations. Beneficiaries include the Ecological Farming Association, Community Alliance with Family Farms, agricultural scholarships for local high school students, the local 4H club, Future Farmers of America, and other local organizations. On October 7, 2017, Full Belly Farm is expecting five or six thousand visitors to celebrate “Still Dirty at Thirty!” – the 30th annual Hoes Down Harvest Festival. Everyone will enjoy music and good food and a circus. Some will do si do in the afternoon contra dance. Some will play in the river and shop for arts and crafts. 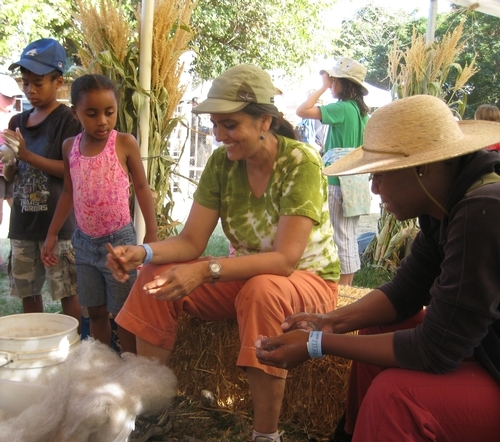 Some will watch sheep be shorn and then card and spin some wool into yarn or carve pumpkins or paint gourds, or pet baby goats or churn ice cream. 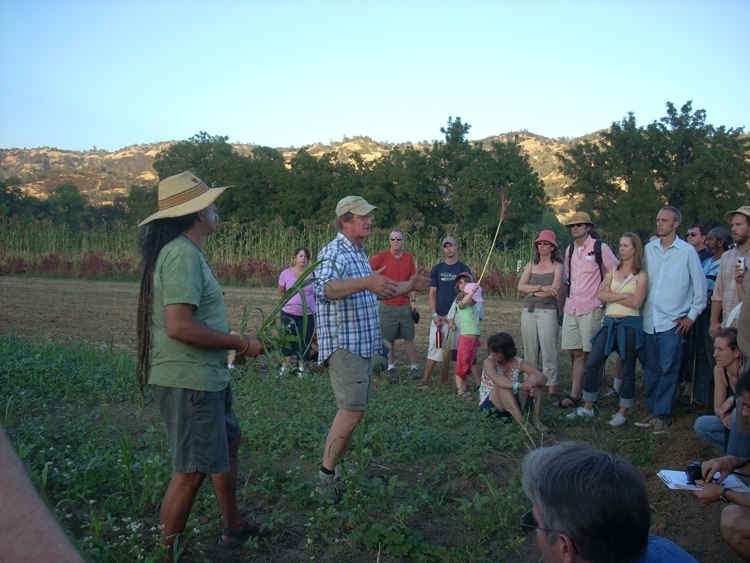 Some will go on farm tours and join workshops on creating herbal remedies or growing the earliest tomatoes. 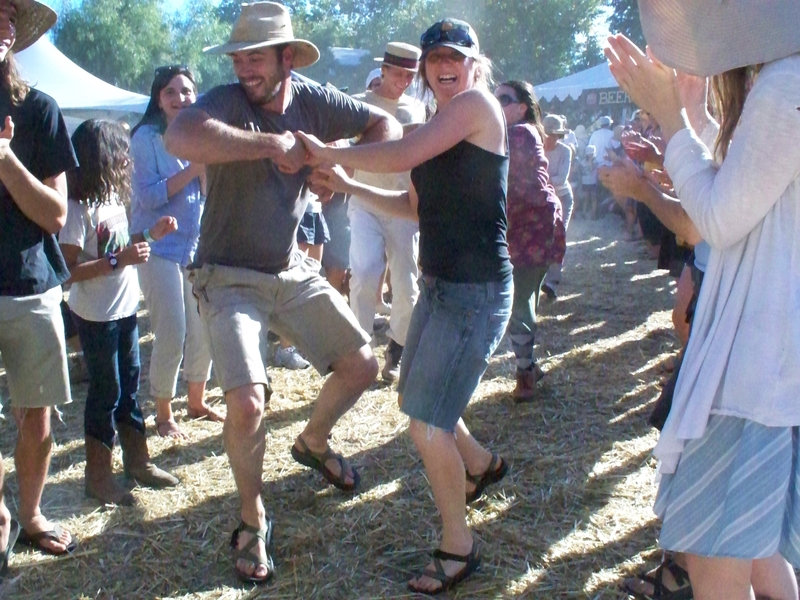 Many will dance into the evening, camp overnight in the walnut orchard, and get up Sunday morning to a hearty farm breakfast and more tours and workshops. You are invited to bring friends and family to join the fun! Saturday Night Camping: $30 per car - no reservations are needed! 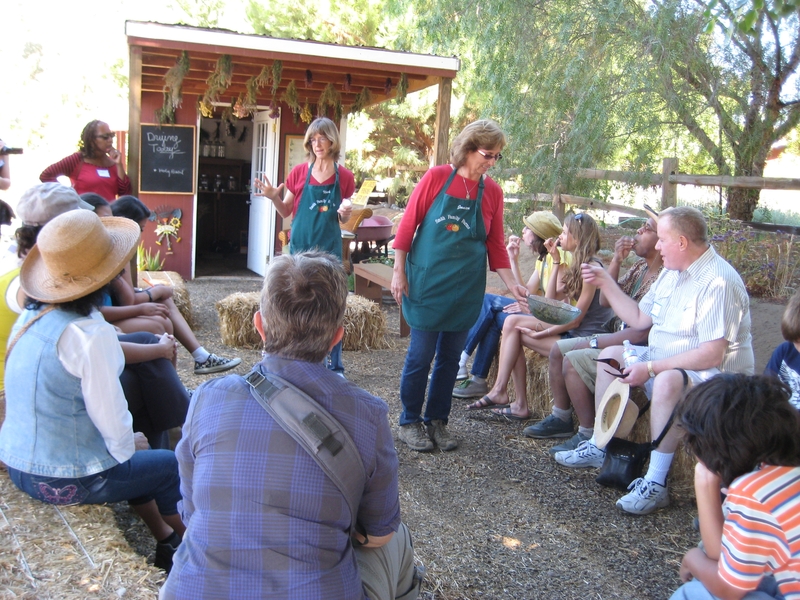 The University of California Small Farm Program and UC Cooperative Extension advisors in four California regions are working with local partners to organize Regional Agritourism Summits for everyone involved in California agritourism. The Summits will be occasions for farmers, ranchers, county planners, the tourism community and others involved to share, learn, and plan together. Agritourism operators, tourism professionals, county, city and state staff and officials, community organizations, agricultural organizations, tour organizers and all others who are connected to California agritourism are invited to join the conversations. Presentations and discussion topics will include county regulations; marketing plans; social media and event organizing training sessions; itinerary development; liability; financing ideas for agritourism development; and more. Each summit was planned by a local team to best reflect the needs of the region, so each will be unique. Each summit will be a participatory, all-day session with lunch provided. To register and learn more, please visit http://ucanr.edu/summits2017. A registration fee of $25 is requested, payable online or by check. 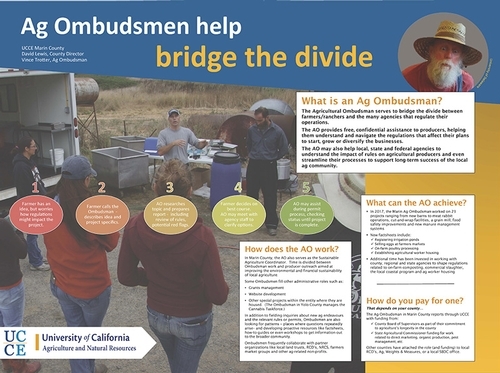 The UC Small Farm Program has been working for more than 15 years with UC Cooperative Extension advisors and others to develop resources and connections for California agritourism operators. 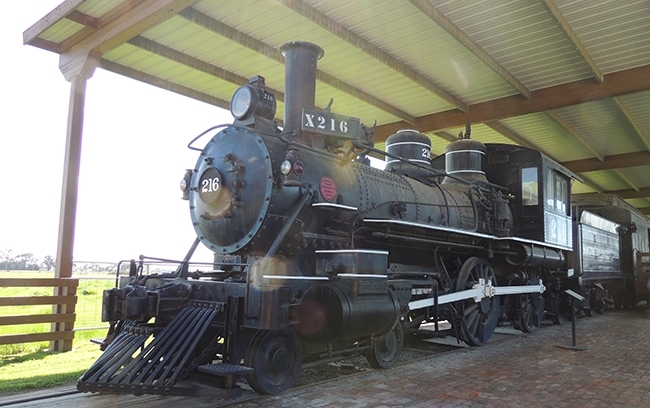 The UC agritourism website hosts useful factsheets and research. 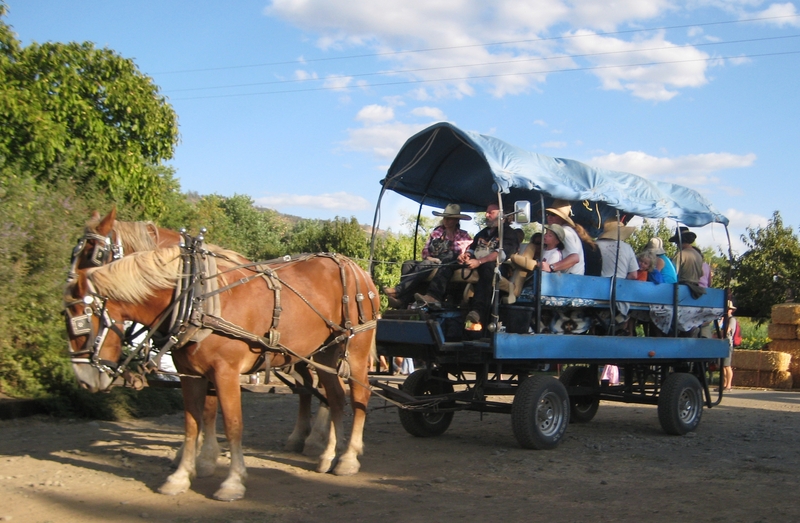 The online agritourism directory and events calendarhelps visitors find farms and ranches to visit. 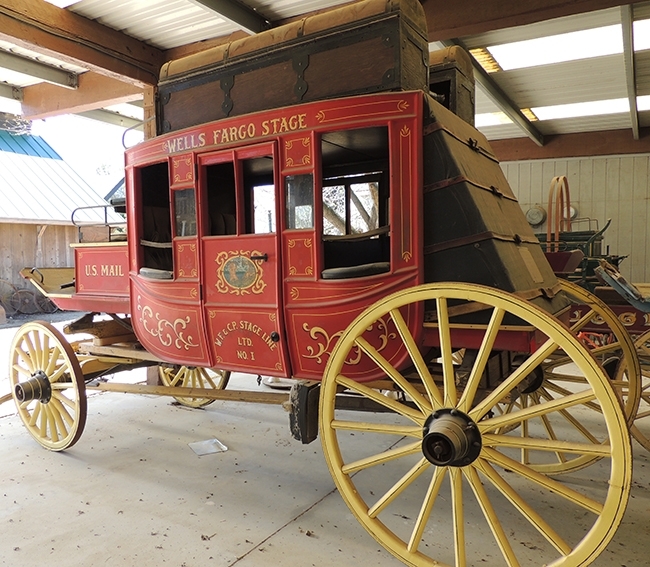 And, the monthly California Agritourism newsletter shares news and resources for the agritourism community. Funding for this project was provided in part by the USDA Farmers' Market Promotion Program. 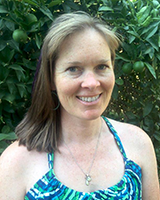 More Information: Penny Leff, UCCE Agritourism Coordinator, paleff@ucdavis.edu, 530-752-7779.